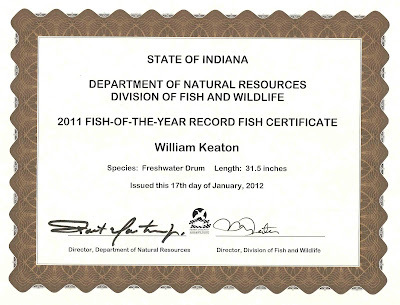 Okay, perhaps the fish he caught on the Brother Nature last summer didn’t win Bill Keaton a prize, but it did win him a certificate “Suitable for Framing!” The certificate was for a freshwater drum, a.k.a. sheephead, a.k.a. grunt, a.k.a. gaspergoo, a.k.a. ... well, the Aplodinotus grunniens goes by many colloquial names. Each year the Indiana DNR conducts a program to recognize notable catches made by anglers fishing in Indiana the preceding year. The fish for which certificates are awarded may not be state records but they were the largest specimen caught and registered of an individual species for a calendar year. Keaton’s recognition-winning freshwater drum was caught on the Brother Nature in early September. The past several years have featured increasing numbers of these drum in the southern end of the lake and from mid-summer on, hooking up with one is not all that unusual. 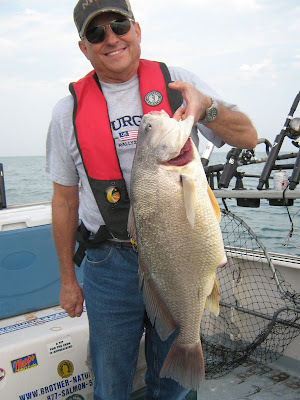 When fishing within a mile or so of the beaches in July and August catching one or more is nearly a daily occurrence. Most of my customers are a bit disappointed when they find out the big salmon or steelhead they had been battling for the previous 15 minutes or so turns out to be a sheephead and so am I. But just a wee bit. 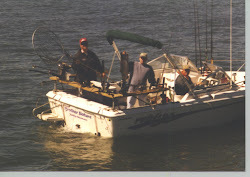 a tight drag and fight deep and bulldog tough all the way to the boat. Most of the ones we catch are as big or bigger than the steelhead we normally catch. And though they aren’t in the same league on the grill as a fresh salmon or trout, they can be palate-pleasers in a variety of simple recipes. So congratulations, Bill. Nice catch! I hope you catch another one next year (as well as some trout and salmon) when you come fishing with me.